Visual enhancement is a staple tool. Universal color codes such as red for urgent, amber for pending and green for available could make your planning more effective. Allow colors to determine a task’s status or importance, or simply use colors for differentiation. Ranging from neon to pastel, there are 40 distinct colors to choose from. It is within your control to assign colors to project parameters for a more organized and structured planning environment. Before using conditional coloring, color schemes must be set. A section with preset and custom options will open. 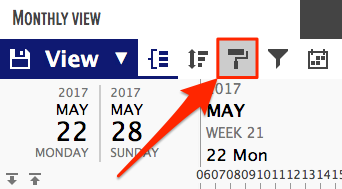 The color of the Gantt charts will change accordingly in the Gantt chart area. 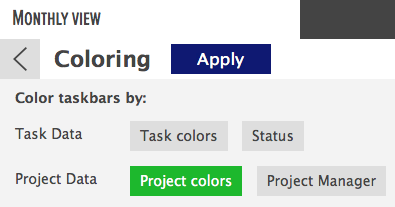 Make sure you have selected colors for your tasks before doing this. The default color for tasks is blue. Use conditional coloring options to create custom views that you can use to get an overview of your project portfolio and tasks from specific viewpoints. You can also color taskbars using task and project custom data fields. Did not find the answer to your question regarding visual planning?